35mm engineered non-fire rated internal oak glazed door with 5mm vertical v-grooves and single large vision panel with brilliant clear cut lines in frosted bevelled glass. Supplied factory finished in clear satin lacquer. Available in standard imperial sizes with 10 years manufacturing guarantee. Stylish glazed internal oak door with elegant contemporary twist on a traditional door design. 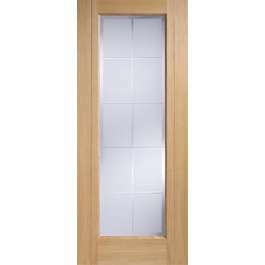 Features two vertical grooves and a large glass panel with frosted bevelled glass. This fully finished door is available in a range of sizes including two panel solid non-fire and FD30 fire doors to match the door design range called Madrid Oak.